» Home Fire Drills Could Save Your Life – Are you ready? Home Fire Drills Could Save Your Life – Are you ready? I read this article about a devastating house fire that took the lives of eight children and their mother, leaving the father and one child behind, and immediately had a chat with my husband about how unprepared we are if something terrible happens at our home. My heart is breaking for this family and I don’t want to end up being a similar story. Please take a moment to go read the article and then come back here to see how this news has affected our family and what we’re doing about it. Today, my family is taking the time to go around to all the windows and make sure they open freely (they have not since we moved here, because they are painted shut). We are discussing and practicing emergency situations with our children and making sure they know what to do. Today we are focusing on fire emergencies and holding home fire drills. Our kids have learned the following and yours should too! They know to feel a door with their hand if it’s closed before they try to open it. They know to keep as low to the floor as they can and get out their window quick. They know to meet us as quick as possible at the big tree in our across-the-street neighbors house. They know to not stop to grab anything. Their life is far more precious than any stuff they might think to try to save. They know to get their baby sister out. One big kid gets out first, then someone else passes the little one out to them and the rest follow. It’s a good, quick system that keeps everyone safe. And we’re making sure they have a back up plan if they are panic too much to think it through. What’s our back-up plan? Well, if Mommy and Daddy can’t get to them and they can’t get their window open they have a hammer to break that window. I pray we never have to use these skills. I pray we never have to find out if they will save our lives. But I know it’s better to be ready than to be caught totally unprepared. We will be holding home fire drills every month at different times to practice what we’ve learned. Do YOU have a family emergency plan? 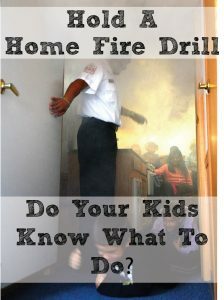 Have you ever held a home fire drill? Do you have any tips for us or our readers? We’ve never had an ACTUAL fire drill, but we’ve talked about it plenty. The design of our house means they’d most likely be able to get out an actual door, but if not, there are windows with easy access to a roof and then to the ground.